One of the latest advancements in non-surgical face-lifting called the liquid facelift is a procedure that Dr. Jacono often uses to help provide patients with a refreshed and more youthful appearance. The liquid facelift offers similar benefits to the traditional facelift procedure without having to undergo surgery. As a facial plastic surgeon and author of several books including “Face the Facts” and “The Face of the Future”, Dr. Jacono understands that not every patient is interested in reversing the signs of aging through surgery. As one of the top facial surgeons in the world, Dr. Jacono sees the liquid facelift as a beneficial option for restoring lost facial volume to the cheeks, the jawline, reducing the appearance of jowls, lifting sagging brows, and removing fine lines and wrinkles. Using a series of non-surgical procedures such as Ultherapy and Sculptra, Dr. Jacono creates a custom solution for each of his patients to help restore a natural glowing and rejuvenated skin with added facial volume to the areas that have become hollow or with deep wrinkles. The Ultherapy treatments work by tightening facial skin without removing any additional volume. It also helps to lift and tone the skin as it tightens. The Sculptra injections help to restore the lost volume caused by the aging process, as well as, stimulating the production of collagen. By replacing this lost volume, the hollow and sunken in areas of the face are restored to look fuller and natural. The additional production of collagen allows for the body to natural add additional volume and reverse the signs of aging. The results are nothing short of amazing as Dr. Jacono’s patients look and feel 5 to 10 years younger without having to undergo a surgical procedure. What Should I Expect with a Liquid Facelift? Since each patient received a custom treatment approach, during your consultation Dr. Jacono can better determine what treatments will be involved and what you can expect from your liquid facelift. In general, though, each treatment is a multi-layered approach to meet each patient’s specific needs. Treatment plans will combine cosmetic injections to treat the wrinkles and fine lines, dermal fillers to restore the lost volume to areas of the face, and Ultherapy sessions to help tighten and tone the visible outer layer of skin. 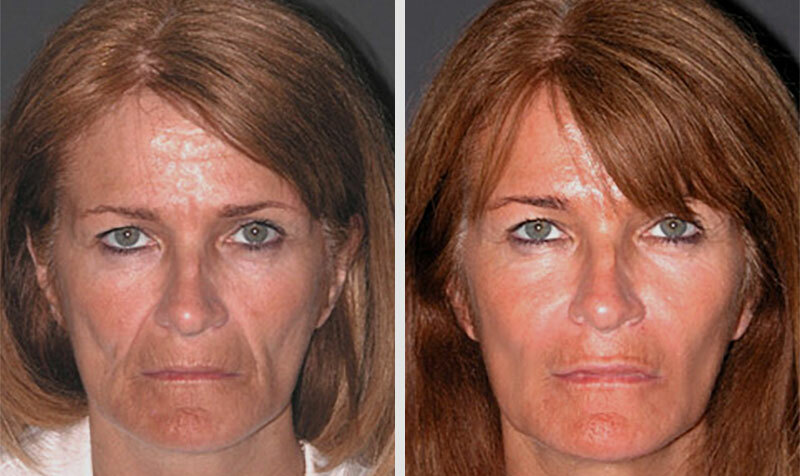 How Long are Liquid Facelift Results? The results of a liquid facelift will vary from patient to patient but on average the results should last one year. If Dr. Jacono’s post procedure instructions are followed, patient’s results can be prolonged. In many cases, patients are encouraged to come in every 6 months for touch ups to keep the natural and more youthful looking facial results to last longer. Am I a Candidate for a Liquid Facelift? Men and women who are looking to restore a fuller and more youthful facial appearance without having surgery may be good candidates for this revolutionary treatment offered by Dr. Jacono. Patients should be in overall good health and have realistic expectations. Women who are pregnant, as well as those with facial skin infections, should consider other options. Liquid facelifts are best suited for men and women who are in their 40’s to 60’s. To learn more about liquid facelifts or to see if a customized treatment plan is right for you, schedule your consultation with Dr. Jacono today. You can also call the J Spa Medical Spa at 516-773-2424 to speak to one of our specialists today to see if this procedure is right for you.